Budanivskyy castle lies aside the traditional tourist routes, so his only visit the castle fans. Although the former fortress located Psychiatric Hospital, the castle is fully available for visits and relatively well preserved. It is believed that by the middle of the XVI century in modern Budanov was a small settlement Skomros. It has long been held near two ways Horde - Black and Kuchmanskyy. In 1549, King Sigismund Augustus allowed the privilege of his wife Galician magistrates Yakub Budzanivska Catherine of valve rename didychne village Skomorokhy (Skomros) Budzan the city. Sometimes the name associate with the word "bundz" - head of sheep cheese. Around 1550 Galician governor Yacoub Budzanovskyy lifted high left bank of the Seret wooden fortress. In his honor settlement called Budzan, worn until 1946. The wooden castle was soon destroyed by the Tatars. At the beginning of XVII century and Ian Martin Khodorovsky in place of destroyed wooden fortress built a stone castle. Rock of brownish-gray built from different-sized rough blocks and a raft of local limestone and sandstone. It was rectangular in plan with four round corner towers. It was the tallest building of the former town. Simultaneously with the construction of a new castle was founded in Khodorovsky Budzan Roman Catholic parish. The first stone church of the Holy Cross was probably destroyed by the Turks. In 1631, the new owner was Alexander Budzanova Sinenskyy and later moved to the family settlement Levochynskyh. 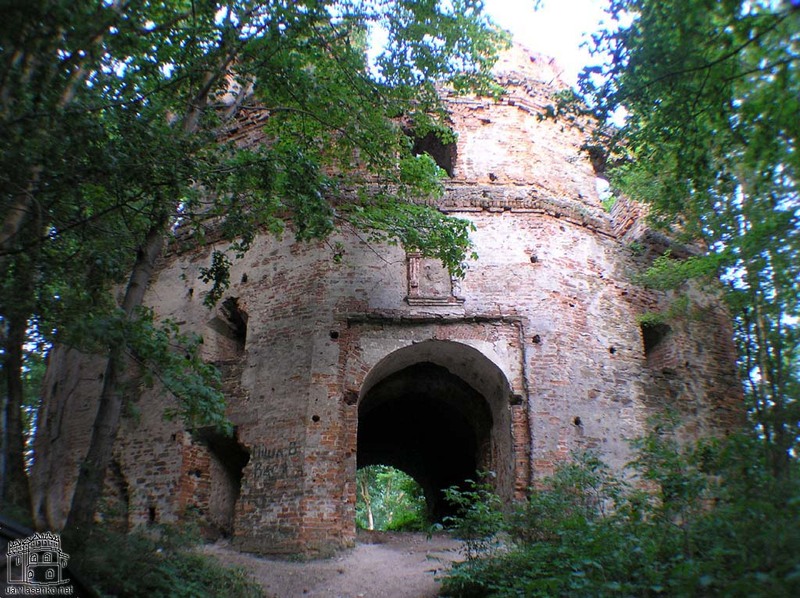 Castle twice destroyed Cossack Bohdan Khmelnytsky - in 1648 and 1651, respectively. Trying to restore it made the new owner Tomas Luzhetskyy. Luzhetskyy himself heroically died during the defense of the fortress from the Turks in 1672. The castle was captured and destroyed by cunning the Turks in 1675. According to legend, local residents know in advance the approximation of the Turks from Terebovlia and hid by locking walls to the castle at night knocked a woman with a small child with a request to let the castle even a child. The attackers were still far away, so the defenders opened the gate. It was a catch: the Tatars invaded the castle through the gate of the ambush and massacred all the inhabitants. Defenders of the castle buried in the field "Pohyblytsya" near the castle, near the forest "Semankovym." Women and children buried separately, and men - including three large graves. At the cemetery and 79 graves are still preserved, and one of the three burials of male defenders is a stone with the inscription: "Here in this place called Pohlybytseyu, rest defenders from the Turks and Tatars in 1675 was." Restored the castle in 1765, Eustace and Mary Potocki. They rebuilt it in the western part of the church. Peredsinok temple priests and arranged with two castle towers. The new church was consecrated in 1838 under the title of the Exaltation of the Holy Cross. In 1846 and restored the northern part of the castle. Through the efforts Kulchytsky priest that same year the castle was given under the convent of mercy, which was at the school and hospital. Then restore one of the towers and part of the walls. This massive stone tower is well preserved until today. The castle suffered greatly during both world wars. Do not preserved entrance gates, the remains of ramparts and ditches. At the tower, which serves as the church wall, miraculously preserved memorial table in honor of the 10th anniversary of restoration of the state. Since 1956 to the present time the castle is psychiatric hospital. The church, which is in a dilapidated condition in 1994 returned to the Roman Catholic community. Continuing its revival. In the former town, and today - the village, which in 1946 called "Budaniv" kept several mansions Austrian period and a couple of churches. On campus Dobromyl that Sambir District, will some other time, and now will address Herburtiv castle, the ruins are located on the slip mountain a few kilometers from Dobromyl. The first information about the castle date back to the 1450th year. Originally a stronghold of trees "Jana, and built it then owner of the surrounding land Nikolai Herburt. However, in 1497 during the attack the castle was burned by the Tatars. More than half a century, namely in 1566, at the same place Jan Herburt brings a new stone castle. The facility has adopted features of the mountaintop, so had an oval shape. The thickness of the walls in places reached up to 4 meters. On both sides housed two round towers, of which survived only basis. A dominant feature was massive in "yizdna tower, which had several housing and commercial premises. Since the castle has always been a purely defensive functions and never was intended for permanent residence, the palace on its territory was not. At the end of the 18th century the then-owners of the Basilian monks allowed to disassemble part of the castle walls to build a monastery, which was being built nearby on the edge Dobromyl. But this time the castle has no defense functions are not performed. In the 19th stolliti bricks and stones from the castle on the little dismantled for building materials. Since then, virtually unchanged structure has reached our days. And finally hired the castle panorama of eleven vertical frames. You can look at a larger size.